If you’re looking for a fun activity that everyone can take part in on holiday, you could do worse than to try your hand at ice skating. It’s a popular sport, especially in winter holiday resorts, so you’re likely to find official and unofficial skate opportunities galore. Should I Have Lessons at Home? Learning to ice skate and having a few trial runs before you actually go on holiday are a very good idea. There are plenty of skate rinks in the UK now, so if you think that you are likely to want to try it on a frozen lake in Canada, it’s a great start to at least acclimatise yourself to skating on ice in the relative safety of an organised rink, or better still, have a lesson or two before you go. Not only will you learn the basics with someone around to help you out – but you won’t have to concern yourself about dangerous ice, or weather conditions. If you’re skating outside, wear warm clothes but nothing too tight that could potentially restrict your movement. Experts say that it’s also a bad idea to wear jeans, because if you get them wet when you fall over it will take ages for them to dry out, and you’ll be stuck wearing cold clammy jeans for a while- which is not pleasant. As with most winter sports, it’s a good idea to layer on the clothes, as once you get started you’ll warm up and probably want to take some of them off again. It also goes without saying that you’ll need a warm hat, and gloves. Hiring ice skates on holiday is easy and usually reasonably cheap. There are two types of skates one is used for figure skating and the other for hockey – but although most people who hire them will probably just be - figure skates and hockey skates. 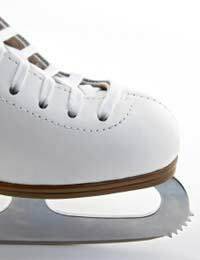 Most rinks and hire firms tend to hire out the hockey boots instead of figure-skating boots, as they are safer and more comfortable for amateurs. Can I Have Lessons on Holiday? You can find ice skate lessons all over the decent ski resorts, so you should be able to find someone who will be able to teach you the rudimentaries fairly easily. Lessons are usually available from a young age, around seven years and upwards, and can be tailored to the individual, from a basic lesson on balance, stride, and how to stop and turn, to skating outside freestyle. If you want to try and make more of the skating, you can also try and find a skating tour, for example there are specialist tours around Sweden, and they are also starting to catch on in North America too. They offer guided skating groups with qualified instructors. These kind of holiday on skates tours operate in other popular ice skating locations, too. What’s on offer with the different tours depends very much on the individual tour company – with some of the holidays you will need to book separate accommodation, and others offer it as part of the package.